Evening Primrose Oil Benefits and Is it Possible to Make it At Home? Have you noticed that you tend to fight weeds in big waves? Each year on our farm, we have a different plant that wants to take over. This year, I find myself pulling a lot of evening primrose (Oenethera biennis). I must admit, when I see a plant over and over again in my flowerbeds, it sends me to my bookshelves to learn a little more about it. Over the years, we have allowed evening primrose to stand guard in a bed away from any of our plants in the rose family. The beautiful, yellow-flowering primrose is a very successful trap plant for the Japanese beetle. Besides being useful in my yard, evening primrose really shines when it comes to promoting better health. I have enjoyed an early spring snack of the roots. This has, in fact, been the most popular use for evening primrose for much of its history. Native Americans used the leaves as a topical poultice for bruising, but beyond that it is a relatively new kid on the block when it comes to natural medicine. The real attraction when it comes to evening primrose is its GLA (gamma-linolenic acid) and LA (linoleic acid). These essential fatty acids aren’t created in the body, so evening primrose oil benefits us as an anti-inflammatory, when taken internally. You’ll find evening primrose oil benefits us in variety of ways, like menopausal hot flashes, high cholesterol, diabetes, chronic fatigue, and MS. There is mounting evidence that it is helpful in the case of arthritis, asthma, and eczema. Can You Make Evening Primrose Oil? My question as a DIYer has been, “How can I make the oil myself?” The answer appears to be, you can’t… or at least you can’t extract any appreciable quantity at home. The seeds are harvested August through September and need to be a bit juicy still. They can be pressed, but in the manufacturing industry the oil is more reliably extracted using a chemical called hexane. I don’t have any hexane lying around the house and I don’t have the patience to press out tiny amounts of oil from very tiny seeds. 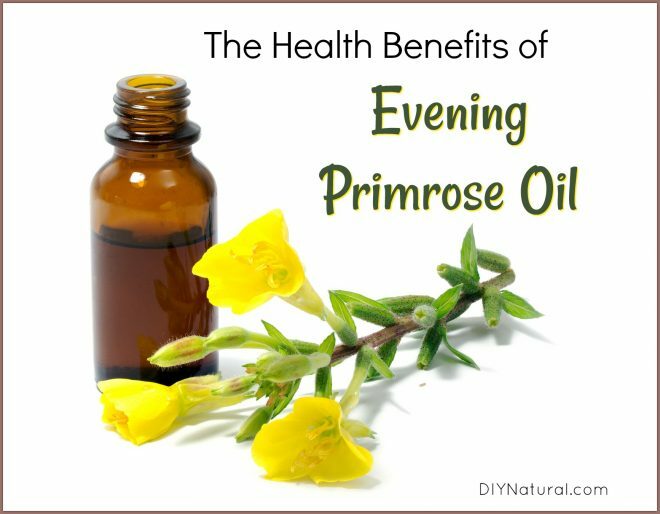 The more realistic way to get your own evening primrose oil at home is to grow the plant, collect the seeds, and eat them. Once you start one evening primrose plant, you will always have more. They readily re-seed themselves. The leaves, root, flower and seeds are all edible and medicinal and they are just plain fun to grow. I have seen others suggest preserving the seeds in an oil, but I like to just keep them in a sealed bag in the refrigerator. I sprinkle them on salads and drop them into smoothies. You may also enjoy the seeds ground just before use, much like you would do a flax seed. Always refrigerate the seeds to keep the oils from going rancid and only grind as much as you need each time. Have you ever used evening primrose oil or seeds in any application? If so, share with us! wow,thanks so so much. Now many will know d health benefits of eveningprimerose. You re Awesome. I am very much impressed, thanks for educating us. Since I took myself off HRT last year I’ve used evening primrose oil capsules – one each night before bed – for its estrogenic properties, along with natural progesterone cream – also before bed – and I do not have hot flashes and my moods are stabilized and much more positive. That’s all I use and I have noticed other benefits as well. I do not use as much ibuprofen as I did for years. I seem not to have the inflammation that I had. I believe the EPR is at least partly to thank for this. I buy the DG Rexall brand and it does the trick. I’m very happy with it. A new app i installed helped me to identify that some is growing in a park nearby! Is it ok to eat those seeds or should i be concerned its treated chemically or otherwise contaminated thanks. ? I don’t believe I’ve every actually seen the plant that it comes from, but I take an Evening Primrose Oil pill every day to help with PMS. To test, I went a few months without and at least for me, it was a noticeable and negative difference during those PMS weeks. The other place that I have been slowly working it into is face and body lotions. I add during the cool down phase and the GLA and LA are supposed to be helpful for maturing skin. I like that it isn’t really as oily/greasy as many other options and so far, no allergic skin reactions for me which is a common issue. I use it in my bath products and lotions that I have been recently making. Its so lovely and fun. I use it in my all natural face serum.